Thai Chi Restaurant can be found in the famous Pyramids at Wafi of Oud Metha District, Dubai, which is a unique destination right in the middle of the city. This unique destination comprises of famous shopping stores, entertainment, lifestyle, fashion and eating places and Thai Chi is a part of this complex. Shoppers will find two different cuisines at this eating place that include Chinese and Thai food, which is a rare combination and hard to find elsewhere under one roof. Thai Chi Restaurant basically combines modern Chinese fare with best of Thai cuisine to produce a scrumptious blend of choice. This makes Thai Chi Restaurant a completely unique culinary experience for the people of Dubai. 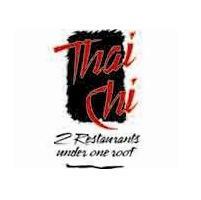 - Thai Chi Restaurant has dine-in option for lunch and dinner. - This restaurant serves two different cuisines under one roof, which are Chinese and Thai. - Veg food lovers will also find numerous vegetarian dishes in the menu of this eating place. - Fish and seafood are also served at this restaurant together with poultry and meat items. - In addition to this, fine selection of salads and desserts are available. - Guests can also order various drinks from its wine and drinks menu along with the food. - People can avail its takeaway service as well, if they want to treat their loved ones with the delicious food of this restaurant. To see the long menu of Thai Chi Restaurant, click here. Thai Chi Restaurant opens all days of the week and its usual opening hours for lunch are from 12:00 pm to 3:00 pm, whereas the dinner time is from 7:00 pm to 12:00 am. Dubai Healthcare City Metro Station 1 is barely 220 metres away from Thai Chi Restaurant in Pyramids at Wafi of Oud Metha District, Dubai. This makes it an easy walking journey of 3 minutes if a person heads in the west direction on 26th Street from this metro station in order to reach Thai Chi Restaurant. Directions from Dubai Healthcare City Metro Station 1 to Thai Chi Restaurant. Dubai Healthcare City Metro station A2 – Dubai bus stop is just 350 metres from Thai Chi Restaurant. Therefore, if a person gets to this bus stop by taking any of these bus numbers; 22, 42 and C7, he or she can easily reach Thai Chi Restaurant on foot in about 5 minutes. To do so, a bus user should head west on 26th Street towards 13th Street. 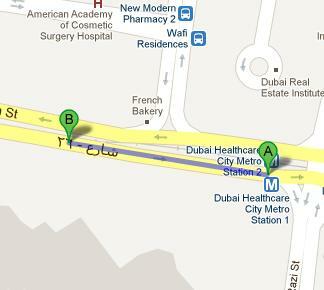 Directions from Dubai Healthcare City Metro station A2 – Dubai to Thai Chi Restaurant.